Setting up cumbersome lighting stands when you are playing in the corner of a pub is often impractical, yet playing underneath a flickering strip light loses its appeal rather quickly! 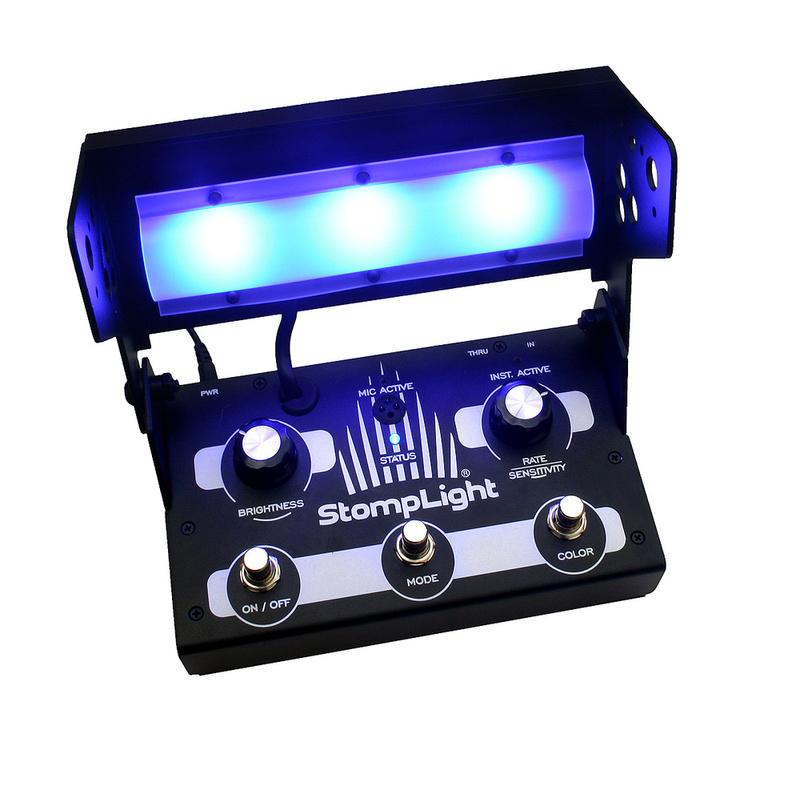 The StompLight, the result of a Kickstarter campaign, aims to change all that by offering a versatile LED lighting system built into a compact floor unit controlled by stompbox-style switches. The LED lighting section, which is protected by a plastic diffusor, is fixed to the underside of a swivel lid allowing it to be set at any angle, while the closed lid provides protection in transit. Power comes from a 12V 1.5A adaptor, which can also be used to charge the optional StompLight PowerBank lithium-ion battery pack, should you need to use it unplugged. The case, which measures 4.75 x 8 x 3 inches and weighs just 4.2 pounds, is made from powder-coated aluminium and folds up small enough to fit into a typical gig bag. The bright (350 lumens) Cree LEDs can be expanded using other StompLight products connected via standard XLR cables, but they are adequate on their own for use with solo performers or duos. Control is via three footswitches and two knobs, and the lights can be set to run automatically, be triggered from audio (external or a built-in mic), or controlled via DMX from a lighting console or other DMX control source. Most DMX512 lighting products are compatible, and the StompLight DMX Pro can function either as a controller or a slave when part of a larger system. An On/Off switch turns on the lights and the Mode switch cycles through five lighting modes, the first of which is Color Wheel. A small status LED follows the lamp colours whether the main lamps are switched on or off, so you know what to expect when you press the On switch. Rate sets the speed of change but also acts as a sensitivity control when using an audio trigger source. Color Wheel cycles smoothly through all the colours, and the Brightness knob allows the brightness to be dialled down if you feel your retinas getting toasted. For many users, that’s all that’s needed — turn it on and leave it to run. The other modes allow you to select a solid colour, have the light brightness modulated via audio using the internal mic or external jack feed, or act as a flashing strobe. When in solid colour mode, the Color switch steps through the colour options. Any modes you don’t feel you’ll ever need to use can be removed from the menu via a power-up ritual that involves holding down specific buttons while powering up, then following the instructions in the manual. The factory settings can also be restored in a similar way. The rear panel is kitted out with three-pin male and female XLR DMX connectors, the power inlet and a pair of quarter-inch jacks for the instrument In and Thru connections. 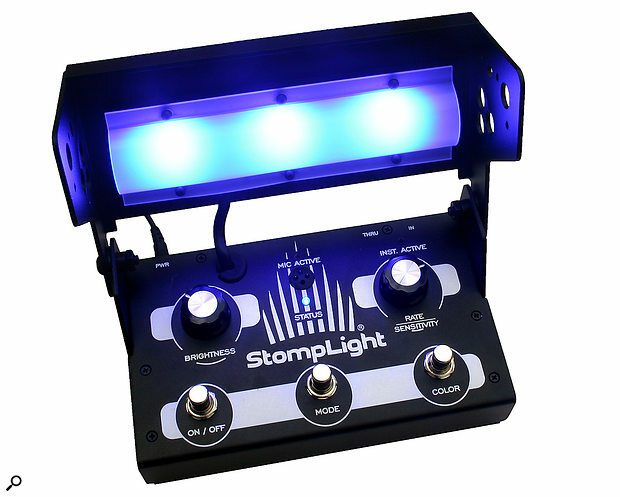 The StompLight has the advantage of being very compact and tough, yet is easy to use. The company also offer useful accessories such as slave lighting units and stand-mounting adaptors. The lights themselves produce a nicely diffuse illumination capable of providing a colour wash over a wide area, unlike some multi-colour LED lights that act more like spotlights. As well as producing a more even lighting effect, the lights are less likely to dazzle than those that produce a narrow beam. The footswitches allow quick changing between modes or colours during performance and that hinged lid is stiff enough to stay in place once you’ve set the optimum lighting angle. In fact the only thing I don’t like is the reliance on an external power adaptor. In comparison with LED ‘cans’, the StompLight can seem a little pricey, but if you need a simple and compact way to make your gigs look better, it is a great solution. I have to admit to not having come across any similar products, so the nearest alternative is a single LED can light. Useful range of lighting effects. Power comes from an external PSU with a fairly short cable. A very practical and effective way to add lighting effects when space is at a premium.